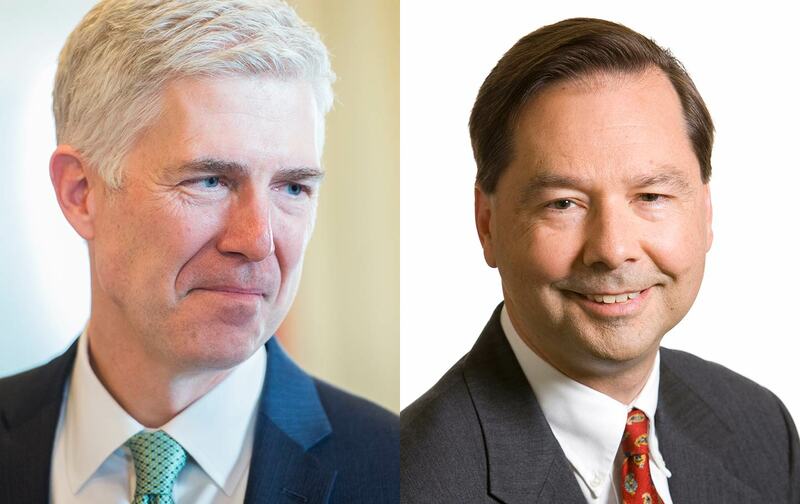 Gorsuch’s ties to Hans von Spakovksy suggest a hostility to voting rights. Few people in the Republican Party have done more to limit voting rights than Hans von Spakovsky. He’s been instrumental in spreading the myth of widespread voter fraud and backing new restrictions to make it harder to vote. 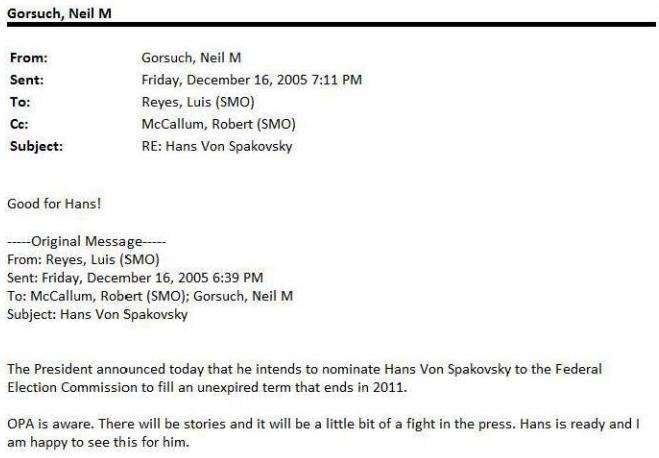 But it appears that von Spakovsky had an admirer in Neil Gorsuch, Donald Trump’s nominee for the Supreme Court, according to e-mails released to the Senate Judiciary Committee covering Gorsuch’s time working in the George W. Bush Administration. 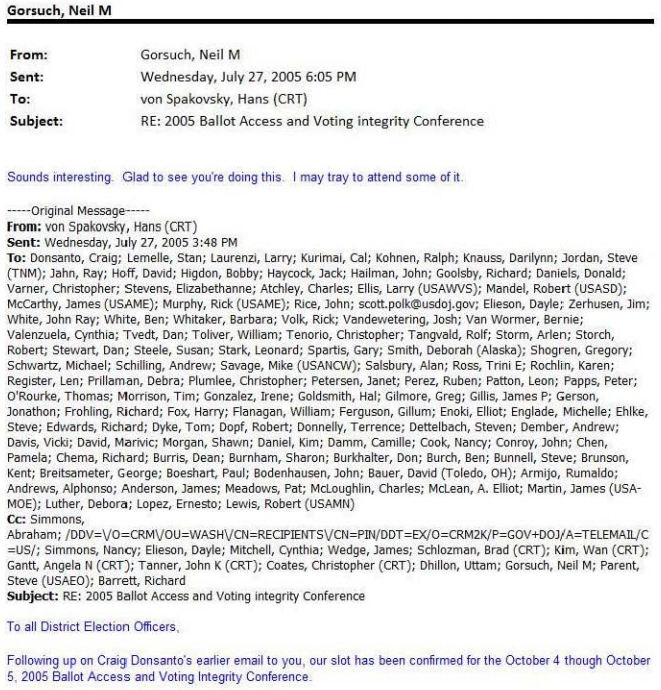 In another e-mail, when von Spakovksy said he was participating in a “Ballot Access and Voter Integrity Conference” at the Justice Department, Gorsuch wrote, “Sounds interesting. Glad to see you’re doing this. I may try to attend some of it.” Though the Justice Department was supposed to investigate both voting discrimination and voter fraud, the latter cause took priority and eventually led to Republican US Attorneys’ being wrongly fired from their jobs for refusing to prosecute fraud cases. At very least, the e-mails suggest Gorsuch was friendly with von Spakovksy. But it’s far more disturbing if Gorsuch shares Von Spakovsky’s views on voting rights. Given that we know almost nothing about Gorsuch’s views on the subject, this is something the Senate needs to press him on during confirmation hearings next week. Her racially inflammatory assertions set off alarm bells among the team reviewing the submission, indicating that the law may have been enacted with a discriminatory purpose. Department lawyers feared the bill would disenfranchise thousands of voters. Atlanta’s Mayor, Shirley Franklin, told the story of her 84-year-old mother, who had recently moved from Philadelphia to Atlanta and could not obtain a new photo ID for voting. Her expired Pennsylvania driver’s license was rejected as sufficient documentation to obtain a Georgia ID card, and she was told to produce a copy of her birth certificate. But Franklin’s mother had been born at home in North Carolina and, like many elderly African Americans who grew up during Jim Crow, never had a birth certificate. After voting for 40 years, she would be disenfranchised by the new law. Citing the high number of voters without ID, the disparate rates of ID possession among blacks and whites, the number of DMV offices that did not issue IDs, the cost of the ID and the underlying documents needed to obtain an ID (ranging from $20 for an ID card to $210 for naturalization papers), four of five members of the Georgia review team urged that the law be rejected under Section 5. “While no single piece of data confirms that blacks will [be] disparately impacted compared to whites, the totality of evidence points to that conclusion,” they wrote in a 51-page analysis. Yet von Spakovsky placed a conservative lawyer on the review team, Joshua Rogers, who argued that the law should be approved. Von Spakovsky began secretly e-mailing Rogers copies of his articles, and arguments and analysis in favor of the Georgia ID law. He told him to password protect his computer so that no other attorneys on the team could see their correspondence. Rogers’s dissenting memo, which was drafted with von Spakovsky’s input, became the basis for the Justice Department’s preclearance of the law. More recently, von Spakovsky has argued against that the Voting Rights Act was “constitutionally dubious at the time of its enactment” and praised Trump’s promised investigation into voter fraud, which has been widely panned by Democrats and Republicans. “The real problem in our election system is that we don’t really know to what extent President Trump’s claim is true because we have an election system that is based on the honor system,” he wrote with John Fund after Trump said with no evidence that 3 million to 5 million people voted illegally. Given that von Spakovsky hailed Gorsuch as “the perfect pick for Trump,” it’s safe to assume he believes that the Supreme Court nominee shares his views. The Senate needs to aggressively question Gorsuch to see if that’s the case. Gorsuch has already cited Justice Antonin Scalia as a role model, who said the Voting Rights Act had led to a “perpetuation of racial entitlement.” Gorsuch, if confirmed, could be the deciding vote on whether to weaken the remaining sections of the VRA and whether to uphold discriminatory voter-ID laws and redistricting plans from states like North Carolina and Texas. In many ways, the fate of voting rights in the United States hangs on this nomination.